The First Division in 2012 was two tight races, with the top four clubs in a squeeze for the championship and the bottom four in a squeeze to fight off relegation. The New York Yankees prevailed among the prosperous clubs, while the Boston Red Sox and Philadelphia Phillies lost their bids to stay in the top tier. 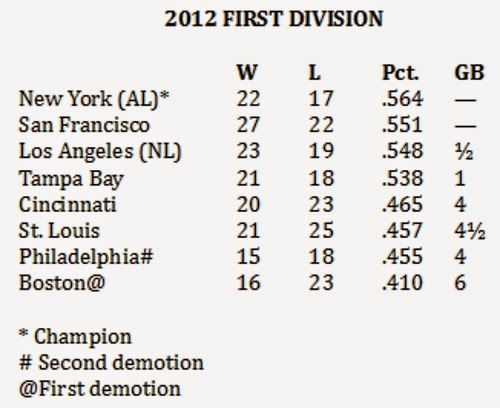 The New York Yankees and San Francisco Giants finished tied on top of the First Division in the games behind column in 2012. But the Yankees (.564) had a better winning percentage than the Giants (.551), so the Yankees were declared the champions. Not far behind, in either case, were the Dodgers and the Tampa Bay Rays. The Dodgers finished 1/2 game back with a .548 winning percentage, while the Rays were a game back and .538. The Boston Red Sox began rebuilding their operation in 2012 and finished in last place to be relegated to the Second Division for 2013. The Philadelphia Phillies will be relegated the same after finishing a mere two percentage points worse than the St. Louis Cardinals, .457 for the Cardinals and .455 for the Phillies.